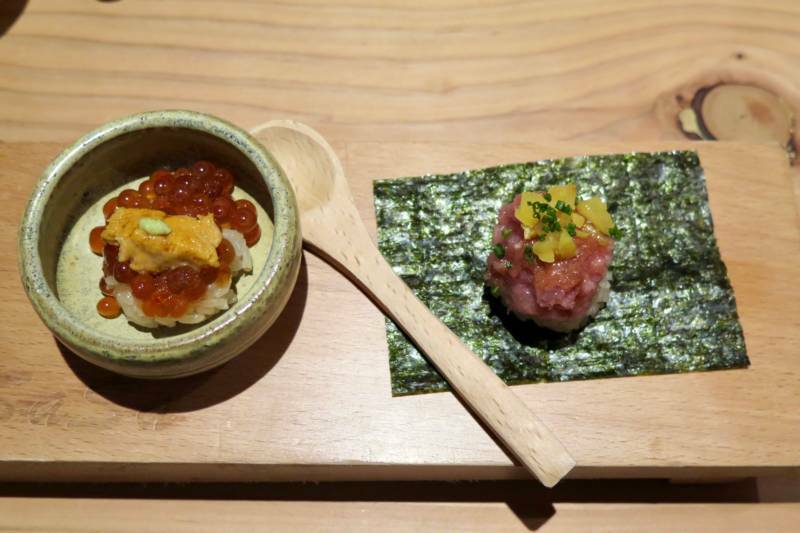 Visit Sasa in Japantown for a quality and affordable omakase experience, watch the Oscars over great food and cocktails at a gala event, get a sneak peek of Noosh at a pre-opening dinner and through delivery, and snag a seat at La Cocina’s Week of Women in Food. 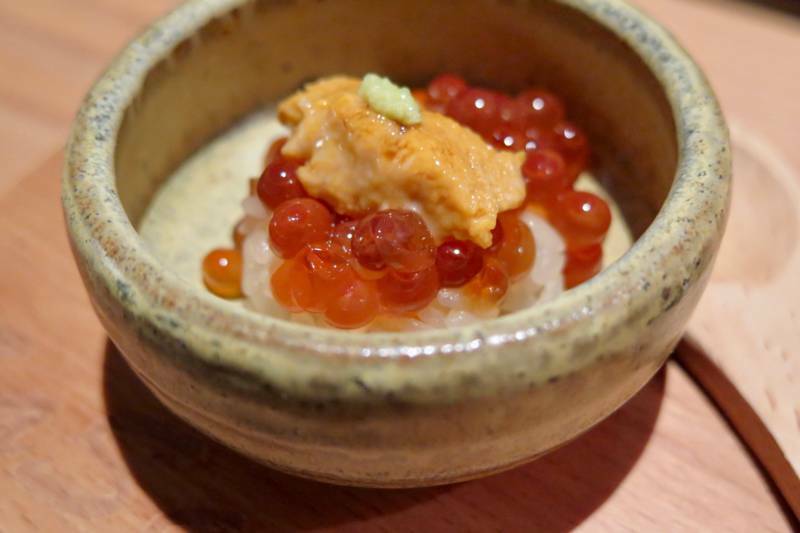 Usually, being a lover of sushi requires a flush bank account, especially if you’re a connoisseur of the good stuff, with many omakase experiences starting at $125 at most sushi counters in San Francisco. 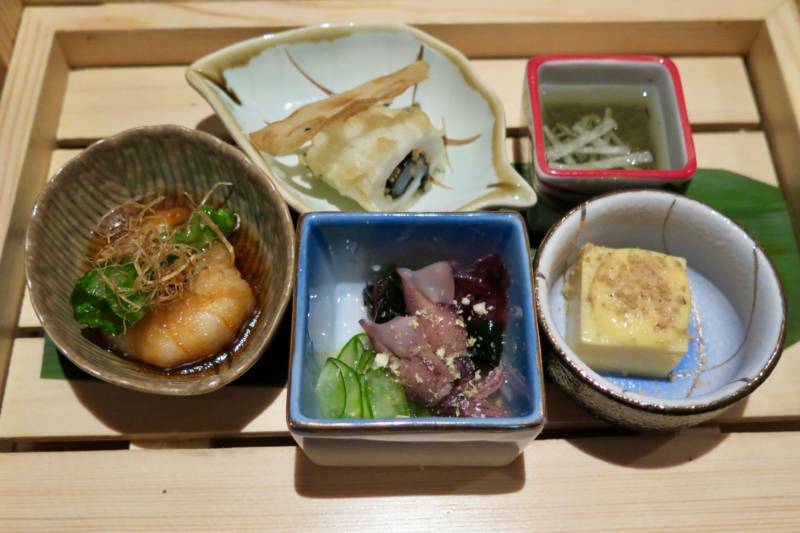 But what if I told you that tucked away in Japantown is a sushi place that has a chef tasting menu for $60, and it features some small dishes, plus quality nigiri selections (eight in all! ), like umi masu (ocean trout from Tasmania) with shiso, and kinmedai (golden eye snapper) that is cherrywood cold smoked and served with yuzu kosho (spicy Japanese citrus paste). 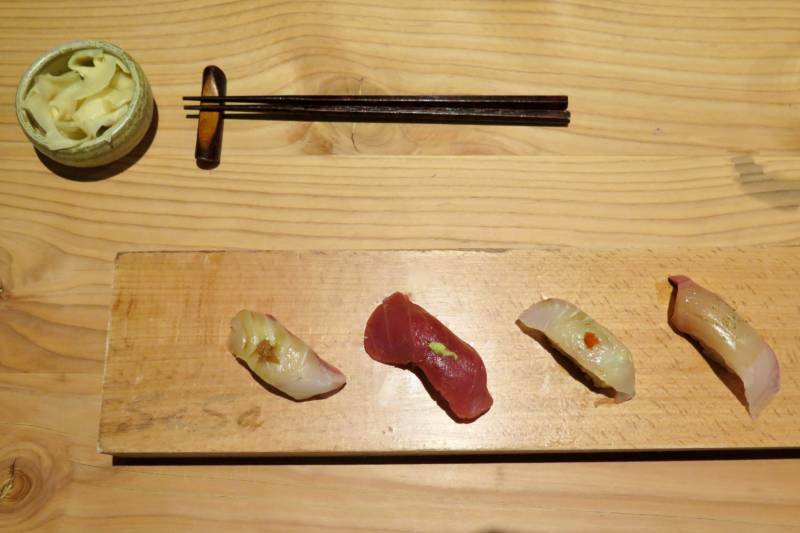 Each nigiri presentation has its own flavorful additions, from dabs of pickled plum paste to lime zest. The rice is also well-prepared and seasoned. Just one clunker for me was the bafun uni from Hokkaido ($12 each) that I ordered as an addition — the quality of the nori wasn’t very notable and was soft. But the huge glasses of sake they pour here help make up for it. Chef-owner Weida (David) Chen is also behind SF's Hinata, which he opened in 2016. He was such a lover of Japanese food that he dropped out of college and decided to learn to make sushi. He was trained for six years by a Michelin-rated sushi chef in the Bay Area and assisted his master chef Takatoshi Toshi (Sushi Ran) at the Global Sushi Challenge in Tokyo, Japan in 2015 (they placed third). The menu offers all kinds of options — you could just come in for a 10-piece nigiri tasting for $45, but then you’d miss the fun opening hassun and closing courses with the $60 chef omakase tasting, like corn tofu and akadashi (red miso) soup. There are also à la carte appetizers and larger plate options. They additionally offer lunch service, in case you’re looking for a special lunch treat, including a nine-piece chirashi bowl. It’s a handsome restaurant, with natural wood accents and tables, and contemporary black chairs. There’s a small sushi bar in the front corner, with room for four, but everyone is primarily sitting at tables. Also unusual: they have a table for large groups. What are your plans for Oscars night? If grazing your way through 18 tables from some of SF’s top restaurants, with cocktails, entertainment, and a beautiful view from Metreon’s City View venue sounds like your kind of night, then you’ll want to get your ticket to the 39th annual Academy of Friends Gala. It’s a huge fundraiser for six Bay Area HIV/AIDS service organizations, and a popular event for the gay community (wait until you see the men in Speedos who are spray-painted gold to look like Oscars statuettes—just be careful not to hug them or you’ll get gold all over you). 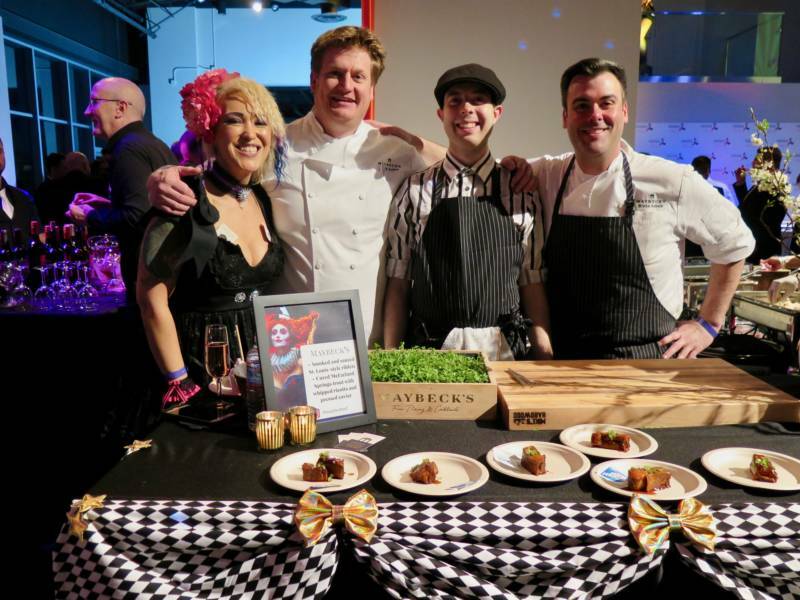 This is my third year curating the restaurants for the gala, and our generous restaurant partners really bring it! The lineup of restaurants this year includes ALX, Avery (VIP), Ayala, desserts from Bluestem Brasserie, Cento Osteria, China Live, Gio Gelati, the new Izakaya Sushi Ran, coffee and espresso drinks from Mr. Espresso to keep the party going, Michelin-starred Nico (VIP), Rooh, Slanted Door, Tank18, The Caviar Co. (VIP), The Saratoga, Uno Dos, and Trace. It’s going to be a fun feast. There will be cocktail and wine stations, a silent auction with fantastic items (from artwork to restaurant gift certificates, like Maybeck’s! ), live entertainment, and plenty of photo opps. The theme is Neptune’s Fantasy, so it’s going to be an underwater-themed world. Expect to see some mermaids. Don’t miss the limited discount code (tablehopper), which is good for 20 percent off your ticket through February 17. 100 percent of proceeds are distributed to HIV/AIDS services. See you there! 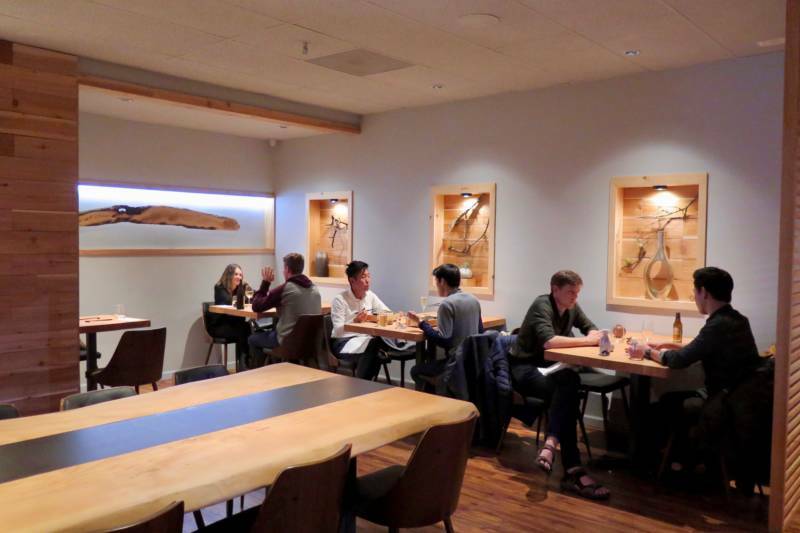 Savvy Bay Area diners have been eagerly awaiting the opening of Noosh on Fillmore. 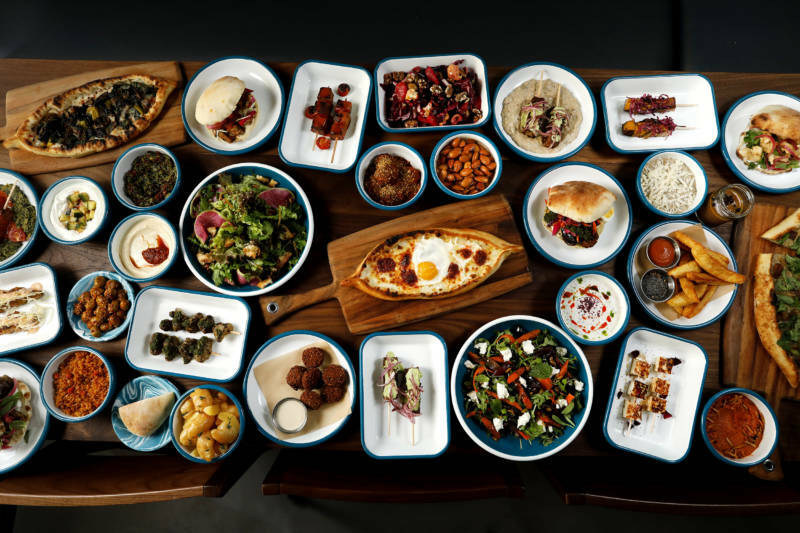 This stylish and soulful Eastern Mediterranean restaurant from husband-and-wife chefs and co-founders Laura and Sayat Ozyilmaz and co-founder John Litz is opening very soon, but until that happens, they’re opening the restaurant for some special one-off events…and delivery! If you don’t have Valentine’s Day plans yet, you’ll want to book a spot ASAP to this abundant dinner that will feature marinated bay scallops, lamb shoulder with lamb bacon marmalade, pear ‘biji biji, and it includes canapés and a welcome cocktail. $95, with dinner served both on Thursday, February 14 (currently waitlist only) and Friday, February 15, with 6pm and 9pm seatings. It’s meant to be a festive experience with shared tables, so don’t expect a private two-top at this dinner. Don’t want to leave your house? Noosh is doing things a little bit untraditionally, and has launched delivery on Caviar! You can try their stunning dips and spreads, such as warm babaganoosh (their cute spelling), smoked labne with cucumbers and Aleppo, and a very notable red pepper muhammara; all spreads come with their daily housemade pita bread, which is so fluffy. 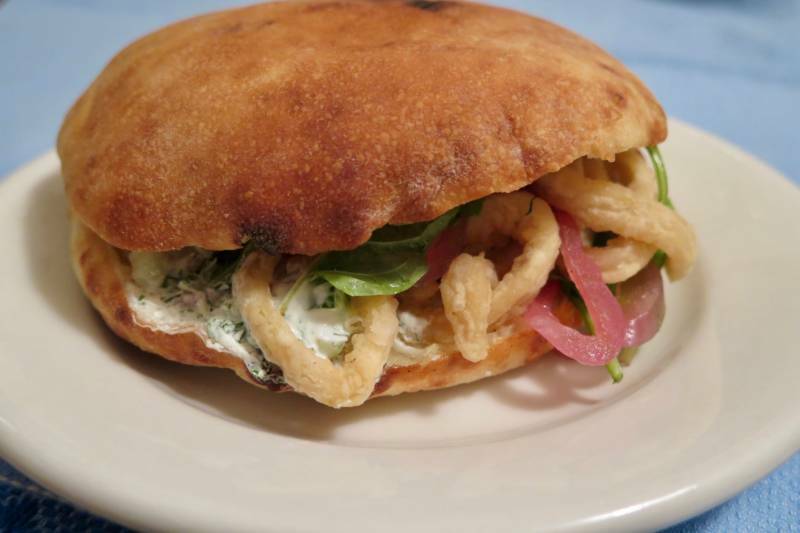 There are also pita sandwiches, like a classic sabich (with hummus, eggplant, and an egg), or a Greek-inspired po’boy with fried calamari and smoked tzatziki. 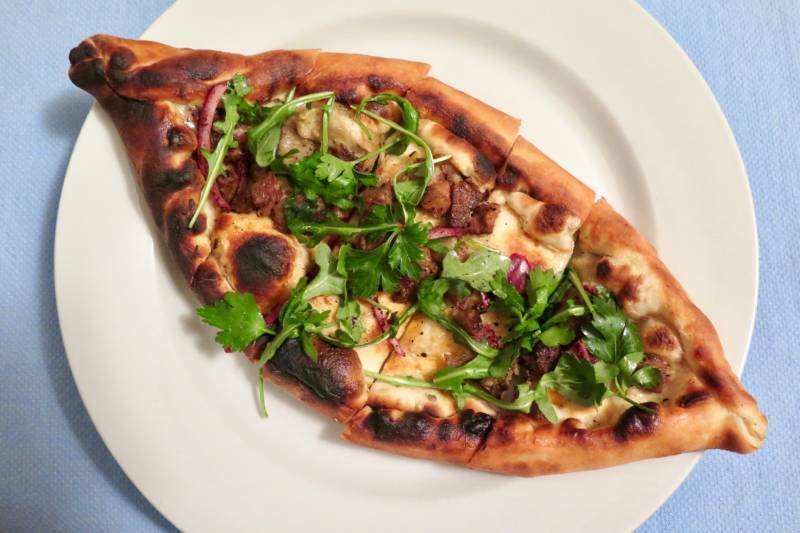 There are pillowy flatbreads shaped like a canoe that will remind you of Turkey, kebabs (including housemade halloumi kebabs topped with a rose-honey and Szechuan peppercorn mix), lamb meatballs (they’re loaded with flavor), a carrot salad, and more. 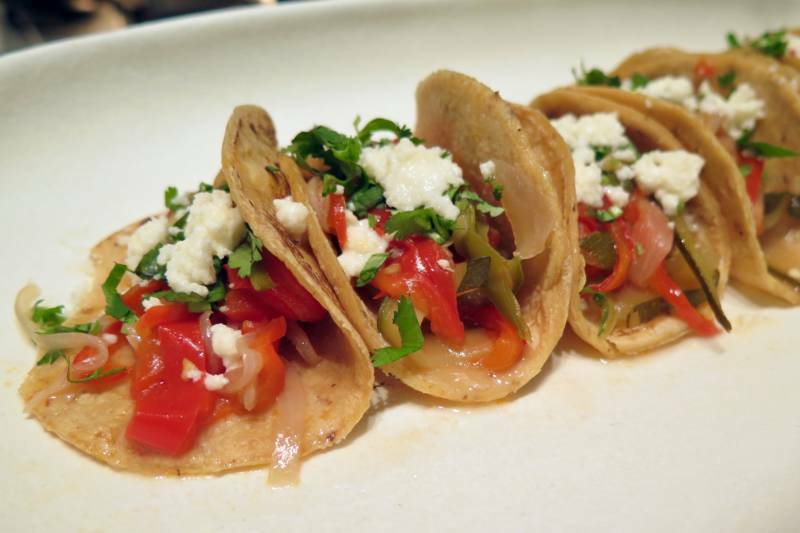 Dishes vary for lunch and dinner; available daily 10:30am–2pm and 5:30pm–9pm. Order via Caviar, and that code will give first-timers $10 off your first two orders. International Women’s Day is on March 8, so why not celebrate the talented and hardworking chefs of La Cocina for a week? These women chefs are collaborating in a series of ticketed dinners called A Week of Women in Food, featuring La Cocina chefs paired with top restaurateurs, winemakers, and bartenders. You can join El Pípila and August 1 Five, or chef Fernay McPherson (Minnie Bell’s Soul Movement) with Erin Wade (Homeroom). Each dinner will accommodate 45–60 guests in one seating for a multi-course meal, plus beer, wine, spirits, and non-alcoholic pairings from some of the most talented women in the beverage industry. Get your tickets soon, some dinners are filling up. All proceeds from ticket sales benefit La Cocina’s incubator program that works to identify, support, and cultivate more women chefs and owners.